of chemical elements in widely different proportions. and sustainable calls for innovative solutions in the glass design. problems in the development, and forecasts the future of glass building in China. development with the context of culture, economy, society’s status and technology. proposes that the future of Chinese glass building is integrated design. currently under construction or in the design phase. film sequences of 3D environments. quality control and criteria of curved glass. the leading design ideas and its load bearing behaviour. 20 meters with slightly prestressed cables measuring just 3 mm in diameter. difference in the effective inner pressure results, which should not be neglected. of the carbon footprint, architecture must restructure its approach and process. for the Reykjavik New Concert Hall were sized. skin façade. Within the renovation two new storeys (12th and 13th floor) are added. several glass products was the basis for the development of a new façade concept. construction industry and the refurbishment of the European building stock. between the panels. The insulated glass panels are sealed by composite spacer frames. phase structural analysis was performed and tests on several levels were executed. with internal pre-stressed cables and integrated dead weight suspension rods. The façade had to keep in pace with the progress on site. are presented. Built examples with solar panels are presented. most non-orthogonal buildings is related to developments in modeling software. curved glass are briefly discussed. steel shoe bracket at the bottom and a fork bracket in the upper zone of the fin. was demonstrated by a series of impact tests. might be affected by the support geometry leading to local stress peaks. possibilities for using glass as a load carrying elements are increasing every day. glass construction design (epoxies, acrylics, polyurethanes, silicones). temperature of the post-breakage behaviour observed during the tests. fibre reinforcement in a SG-laminated glass beam is a very promising concept. that the concept of the glass-steel column is perfectly feasible. owner’s operations are increased. Finally, it is difficult to recycle laminated glass. effectiveness of the loose laid approach. including an aluminium honeycomb core continuously bonded to both glass panes. development, testing and fabrication method. Finally, a design method is proposed. temperature were investigated in climate tests. Glass used in structural applications enables a higher level of transparency in façades. improve several properties due to the elastic behaviour of the interlayer material. beams with different cross sections and combinations of glass and steel were tested. with conventional laminated glass beams. characteristic features, which significantly differ from standard laminated glass. a girder that comprises a combination of transparent thermoplastics and wood. making use of the maximum cold warping possibilities of laminated glass panels. the corners curved glass elements with a very small radius of 465 mm were used. with the structure related to production, mounting etc. will be concluded. (I) was built in 2009, with a design resulted winner of an architectural concourse. construction methods applied to this particular application. fabrication methods, and the testing that was completed. designed a glass structure to re-establish the protection of the building envelope. demands of reconstructing 18th century building elements. duration, methods of load application and location of high stresses. requiring special permissions by the City of Chicago for construction to begin. together during an emergency situation. led to the suggestion to have the dome made in glass, out of its extreme contrast. complete dome is a reliable structure of glass and tensile spokes. park garage a glass entrance building was designed by architect Kraayvanger Urbis. structure of the roof is an innovation in the world of making glass structures. was made by architect Cees Spanjers, Mick Eekhout and Octatube Engineering. sparkling crystal in the landscape. testing was carried out, based on previous research on acrylate adhesives. design methodology can lead to architecturally interesting structures. known temperature field thermal strains, stress field, and deformations can be calculated. In the paper the theory governing the stress field and deformations is presented. A viscoelastic behavior with the structural relaxation of glass is taken into account. determine the amount of energy released at failure). The options to limit the consequences of energy release will be discussed. The result of application of one of these options to the design of reinforced glass beams is shown. impacted the edges of the glass layers of the beams. The resulting Element Safety Diagrams of each design is discussed. Relativized curves are used to compare the safety of the designs. are able to predict the in-plane stiffness and the force necessary to obtain a certain horizontal in-plane displacement at the top. and sporadically at cross-sections with laminated glass. 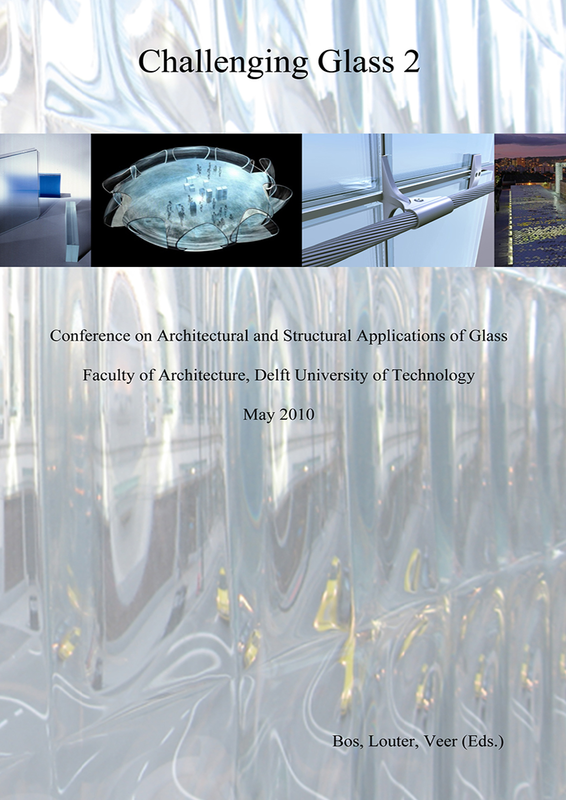 Thus a research project was initiated by the German Steel Construction Association (DSTV) and the German Ministry of Economics, by which the buckling of pane-like glass columns with mono- and laminated sections was thoroughly investigated. The article focuses on the results for buckling with monolithic sections of heat strengthened and tempered glass, giving buckling curves proposed by derivations and experiments. and nonconforming heat-strengthened glass. The completed testing also has implications for glass quality control processes. analysis. A comprehensive review of the various damping concepts, coefficients and physical backgrounds will be summarized. The mathematical model is analyzed by Finite Element Method and by STRAND 7 software system. In this paper, the consideration of various damping concepts using FEM for the harmonic and transient dynamic analysis is addressed. Several key points are summarized. structural behavior . The technical approach for the assessment and management of the strength and durability of composite glass elements was developed basing on this position. The management of glass composite strength foresees the use some control tests of the mechanical state of glass components in the composite together with the specific constructional and technological solutions for strength increasing and maintenance in different service conditions [1-5]. Some results of the assessment and management of quality, strength and life time of the annealed and strengthened glass elements as the components of composites with increased carrying capacity are discussed in a paper. information on the initial surface defects in glass elements. The correlation between the data on glass surface defects, fracture resistance and structural strength of glass is analyzed using the results received at the testing of different types of specimens. It is shown in the paper that quality management of the processing of glass elements gives a good possibility to control the strength of load bearing glass structures. load. Details and challenges of the numerical algorithm and coding are presented, together with the verification procedure that was performed through comparisons with results from analyses using general-purpose finite element programs and from available literature. In parallel, experimentation was performed to determine the dynamic mechanical properties of glass by testing the material in a Split Hopkinson Pressure Bar. under different environmental conditions and different degrees of damage has resulted in a more clear picture of the stress-corrosion mechanisms involved. The effects of these on long term strength are discussed. strength and statistics of strength data.This “invisible” damage explains most if not all of the non-homogenous distribution of the test results. It is shown that removal of this damage on the edges of glass elements increases the engineering strength of float glass significantly.